Listing courtesy of Daphne Peterson, Keller Williams Realty. 28 stunning acres at the south end of Cloverdale, currently in the County. There is a fixer home up the hill with stunning views of Alexander Valley- the house is within an area that likely can not be further developed as it is in a conservation zone. The 20 acres on the Eastern side is flat with fabulous soil. Could be a ranch/farm or has serious development potential. There is a scenic creek at the far Eastern end. 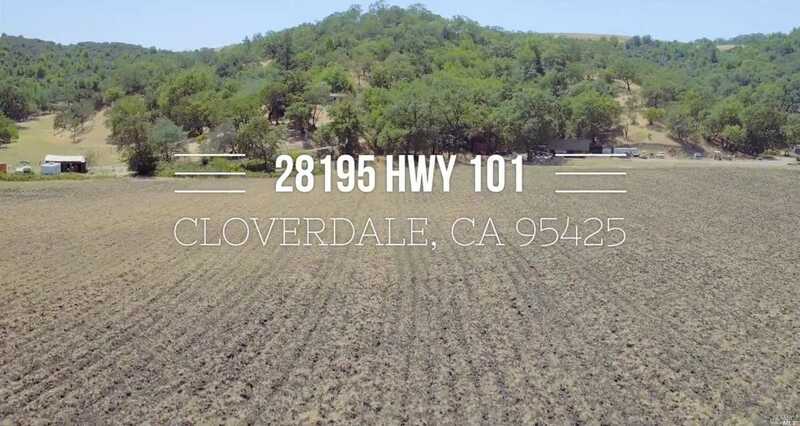 Please, send me more information on this property: MLS# 21619327 – $5,900,000 – 28195 Hwy 101, Cloverdale, CA 95425. I would like to schedule a showing appointment for this property: MLS# 21619327 – $5,900,000 – 28195 Hwy 101, Cloverdale, CA 95425.